Elfrida Andrée was a prominent figure in Sweden in her day, not only as a composer but also as a campaigner for women’s rights. She was one of the first women actively to pursue a career in music with any success. Her sister Fredrika became an opera singer. Both had studied in Leipzig. In 1867 Elfrida, despite competition from seven male candidates, was appointed organist of Gothenburg Cathedral, making her the only female cathedral organist in Europe at the time. Sweden had to wait 120 years before another was appointed. In recognition of her services, she was later elected to the Royal Swedish Academy of Music. She was also the first Swedish woman to conduct a symphony orchestra. Gothenburg was to be her home for the rest of her life. Her compositional oeuvre focuses on orchestral music, yet she also ventured into opera, chamber, piano, organ, choral and song. The composer worked on the score of her Second Symphony in A minor during the summer months of the 1870s, completing it in August 1879. It had to wait until 1893 to be premiered in Stockholm. The performance was a disaster due to the inept work of the copyists. Andrée, as a woman, was not permitted to acknowledge the applause on the podium, and neither was the audience’s desire for the finale to be encored granted by the conductor. As a result of the fiasco the composer became ill from the shock and disappointment of it all. However, some consolation was afforded the following year when the work won a prize in Brussels. The Symphony is cast in the classical four movement mould and is a delight from beginning to end. The influences of Mendelssohn and Schumann are apparent. Long over-arching melodic lines are a component feature. The opening movement is the longest at 11 and a half minutes, and it opens with a nervous energy. This soon gives way to a generous outpouring of seductive melodies, sunny, affable and upbeat, with the scoring imaginative and colourful. A shorter, lyrical Andante follows, then a sprightly scherzo, deftly handled by the Stockholm players. The finale opens with a broad weighty theme; the whole tenor of the movement is resolute, determined and robust. Andrée suffered disappointment again with her opera Fritiof’s Saga. It was a collaboration between the composer and the Nobel Prize-winning author Selma Lagerlöf for an opera to be premiered at the inauguration of the new Opera House in Stokholm in 1898. No one showed the slightest interest in it. Determined woman as she was, Andrée re-forged it into a five movement suite. Its late-Romantic complexion with ‘advanced harmonies and refined sonorities’ are heavily indebted to Wagner, whose music had been introduced to the composer by her opera singer sister Fredrika. Like the Symphony, it luxuriates in a wealth of melody and lyricism. The Prelude’s big tune is as good as any, memorable and imposing. Some of the movements are re-workings of arias from the opera. The fourth movement Fritiof's Infatuation, originally a tenor aria, is etched on the solo violin, and makes for a ravishing interlude. Both these works are here receiving their world premiere recordings. The Stockholm Symphony Orchestra under Gustaf Sjökvist delivers persuasive accounts of these captivating scores. The Studio 2 venue provides a warm, resonant acoustic to best show off this music. Liner-notes are in Swedish and English. 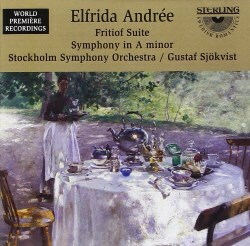 Elfrida Andrée is a composer most definitely worthy of attention.